There are two absolutes when beginning any training program. 1 – You should write out a structured training program and try to stick to it. 2 – Don’t necessarily stick to it. All programs should have a plan with some scientific basis. The science can be as absurd as you want, as I’m all about testing as it’s the best way to learn, but there should be a scientific theory about what you’re trying to do. If not, just go out and play. Writing a schedule should be somewhat painstaking because you’re trying to anticipate all of the possible scenarios and variables. Then, once your theories are soundly structured, you’ll want to do your best to follow it or you’ll never learn whether or not your theories work. To stick with an entire program, however, should almost never happen. Besides life getting in the way the biggest program variable is your body’s recovery ability. If you aren’t recovered you should not stick to your schedule. If you’re always recovered your planned program was probably too easy. Therefore, build your schedule knowing that it will change. If you have time, plan what you’ll do to stay on track when the schedule goes awry. Here’s my program through March. As iron clad as it looks now I’m certain I’ve overlooked something and that it will change. As we move into the program I’ll eventually present each individual workout so you can see what I’m doing. The dietary component of this plan will be vegetarian. But it will be fully applicable to carnivores as well. It will also be revolutionary. Keeping in mind that revolutions don’t always succeed, follow my plan at your own risk. For reference: HYP is hypertrophy, ARC is aerobic restoration and capillarity, MAX REC refers to muscle cell motor unit recruitment, or power, training, PE is power endurance (can be a number of different energy systems that will be based on the sport targeted), and Patxi days are massively long training days based on Spainish climber Patxi Usobiaga’s insane training schedule. wow, this is really helpful. Good to know that I dont need to follow the overall hybrid to a T. Your program looks really interesting to follow. By scientific theory based programs do you mean theories like muscle confusion? max interval sports training? Not at all. Those are marketing slogans based on science. Scientific principles are based on improving the performance of various energy systems. My series of 90x articles is explaining this in some detail. I'd point you to it but there's no archive page up yet! Thanks, no worries Ill find them. What I dotn get is Usobiaga only trains. Doesnt climb a lot. His excuse was "I am not talented as most people are so I need to train harder". He does a lot of power stuff with the campus and everything but why does he not get injured?And why does he train more than he climbs? Hes like the simpson guy…. He climbs a lot. In fact, he has more hard onsights than anyone in the world (though Ondra is probably gaining quick). And he does get injured. He just had shoulder surgery. That's the price you pay when you're setting standards but someone's got to test the limits of what is possible and if you never fail you'll never know you were at your limit. I think that's a bit over the limits. Ondra seems very talented, almost up to sharma's level. I never knew Patxi climbed outdoors. By looks of the movie progression it seemed he only climbed indoors. Anyway all that power stuff could definitely flare my tendinitis (which is healed). 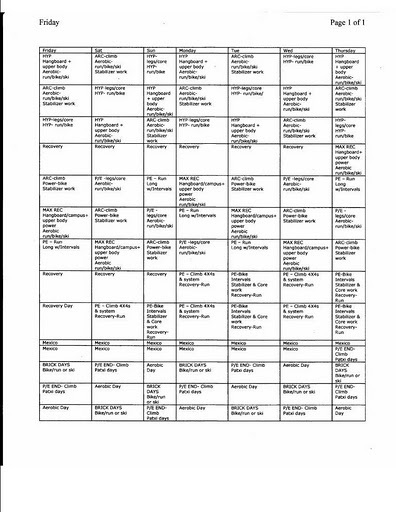 Steve, i'd love to see a higher resolution image of your climbing training schedule. Is one available? Just re-loaded it large but it still doesn't work. Not sure why. Maybe you can save it and then enlarge it. If you leave you email I can mail it also.